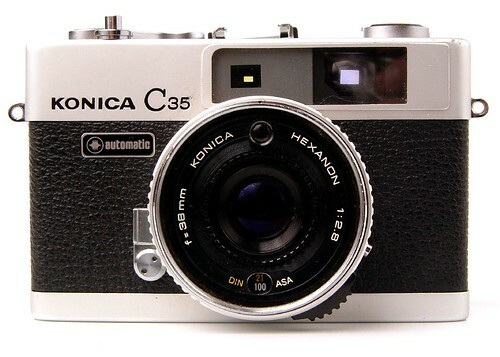 For a list of rangefinder cameras, see the Category: Rangefinder. Rangefinder cameras are those that use a coincident-viewing distance focussing mechanism. The most common form, as used in cameras like the Leica and other classic 35mm cameras, use a prism and mirror arrangement between two viewing windows. Adjustments to the lens focus change angles of the prisms and align two coincident images, when the images are superimposed the lens is in focus. With a large enough rangefinder base this can give extremely accurate focusing. Other styles of rangefinder do exist, such as the electronic variety found in the Contax G1 and G2 cameras. In general, "rangefinder" focussing is often used to describe any focussing mechanism that doesn't view directly through the taking lens (or an identical copy of that lens, as in Twin Lens Reflex cameras). Rangefinder focussing is very fast and accurate even in low light especially with wide angle lenses, but is less accurate for longer focus lenses. This page was last edited on 23 October 2017, at 10:46.